With all the promos Cebu Pacific had last 2006, it’s pretty hard to avoid not booking through them at least once. Their acquisition of brand new Airbus A319’s, enabled them to offer flights to more regional destinations, which in turn gave more Filipinos options for cheap travel both domestically and overseas. I flew with them twice last year: to Cebu and to Bacolod, both originating in Manila. Back then Cebu Pacific was still giving out free bottles of C2 Iced tea. I hear that they’ve stopped giving them out this year (to the dismay of Pinoy travelers who are used to freebies). I wonder if they still have their fun games. I was able to buy our roundtrip Cebu tickets through their online booking facility, during their Piso promo (which came after their 10-peso promo). On the promo fare, I was able to buy 2 roundtrip tickets for only Php3,100+ (approximately US$60). Nice, no? I was actually aiming to get Manila-Tagbilaran-Manila tickets as we’re bound for Bohol, but back then, they only have 1 flight to Tagbilaran so I keep on getting the non-promo fare prices. For the Bacolod flight, my sister and I bought our tickets direct from the Cebu Pacific Ticketing office in Robinson’s Galleria. It was an emergency trip, and since we will be travelling with a minor who’s only getting a one-way ticket, we had to buy it from them directly as their website cannot allow bookings for minors travelling alone. Since it was a Sunday, the ticketing office wasn’t as crowded as it gets during their crazy seat sales. Waiting time was only about 10 minutes, and the people behind the counter were friendly and courteous. For 2 roundtrip tickets and 1 one-way ticket, our total was about Php7,500+ (approximately US$150). The two flights I had with Cebu Pacific was certainly different from the flights I’ve taken with other low cost carriers. For one thing, as mentioned, they gave out bottled iced teas (now discontinued). Another is that they have these fun games. Basically, it’s like a “bring me” game: the flight attendant would call out an item, and the first one to bring out said item gets a prize. Prizes are Cebu Pacific products like cellphone holder, water bottle holder. Basically merchandise they sell onboard. The million dollar question: Are they always on time? 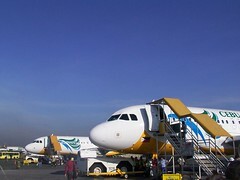 On the four flight segments I flew with Cebu Pacific, they were nearly on time. I’ve been lucky so far and haven’t experienced more than 30 minute delays. If you ask other travelers though, they would say nearly all the flights they had with Cebu Pacific were delayed, specially the international flights. I guess it would depend on how lucky you are that day. Will I book with Cebu Pacific again? i have been regularly flying with 5J, unless if PAL has a cheaper fare. i have flown with 5J this year, and napansin ko lng medyo na de-delay na nga sila lagi. i have a 1-hour delay flight once tapos may 3hour delay din ako recently. Yup, they still have those games and giveaways, at least as of last Holy Week. But now they give out this super-sweet pineapple juice that I can’t drink. WIsh they bring the C2 back. BTW, was great seeing you today! That was a pleasant surprise. Please send me your email so I can send you pictures. my email is gypsysoul73(AT)gmail(DOT)com. I just arrived via Cebu Pacific here in Cebu yesterday and the free snacks is no more (blogged about this here) but its now for sale at exhorbitant rates! Also, palagi na rin delayed. Hmmm, Cebu Pacific should get their act together. I mean, discounts are great and all, and being a budget airline you *do* get what you pay for, but damnit, it is too much to ask for great service? Estan: read your post. Grabe ang pricing ah! I recently flew from Tagbilaran via CEB and I was actually waiting for some freebies like even drinks from them, because the last time I flew from Kuala Lumpur I got a bottle of Nature’s Best, it would seem that only international flights have free drinks now? So far they are dong ok in terms of schedules. 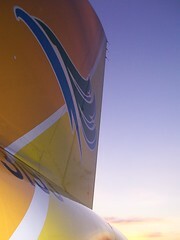 dahil sa mga commitment.So I am certifien CEBU PACIFIC Fan or a youth fan 12yrs old palang ako..THANKS!! call me pathetic or shallow, pero consuelo na lang sa frequently delayed flights nila e sobrang goodlooking ng mga male and female attendants nila. kahit na irritated ka na on board because of the delay, those fresh, cute faces and their extremely professional service makes you temporarily forget the headaches of the delay, until you arrive at the Manila Domestic Airport. chaos ulit. hehe. I’ve been reading your entries about 5J. Thanks for flying with us. Really? I had a friend who booked from overseas using a foreign CC, and never had a problem. It’d be terrible if you had to call them from overseas — waiting for an agent to pick up often take several minutes. I really hope Cebu Pacific would also make as much effort in improving their ground service as they are in their marketing campaigns. Hi Nina! I booked tickets online less than a year ago, the transaction was a breeze then. But when I tried to buy tickets early this month, the agent told me that they no longer accept cards from Europe. I hate making phone calls! Last night I made another follow-up on my e-ticket and the agent made me wait for so long, I even heard them talking and laughing, for a moment I thought my call was transferred to a night market. HI… magkano bah first salary if flight attendant ka ng CEB? kasi sa PAL 40K first pay, how about sa CEB? please reply at my email nalang macyd4@yahoo.com … pwede din dito but kng pwede email nlng hehe thanks! 40k na sweldo ng flight attendant ng PAL? haha. kakatawa ka naman. wala pa nga atang 20k sweldo ng mga yun FYI! kahit international na. how much nga ba ang first pay sa CEB flight attendants? 8k lang sa pal no. 40k kayo dyan. how much is the salary for ticketing agent in cebu pacific? I don’t know, I don’t work for Cebu Pacific.